History of table setting from service à la Russe to Sandra Lee’s tablescapes. The strange, creative, and occasionally tacky history of table settings. The table service of the Prince-Bishops of Hildesheim complete with a glittering silver epergne and candelabras dating from 1763, in Augsburg, Germany. Once a year, on Thanksgiving Day, I become obsessed with setting the table. Years ago, my sister and I started a tradition of gathering branches, leaves, and pinecones and using them to decorate our Thanksgiving table, and, every year, I still feel compelled to create a perfectly whimsical tableau. I braid bittersweet vines into the chandelier, fill vases with acorns, and strategically scatter leaves down the table’s center. Last year, I convinced my brother to knock an abandoned hornet’s nest from a tree so I could use it as a centerpiece to complete the wild, woodland feel within our dining room. In daily life, setting the table is often just a chore: laying a plate, fork, knife, and napkin in front of every chair. But, on special occasions, many people try to transform their tables into dreamscapes—and these days, there’s a whole sector of the media devoted to churning out new table-setting ideas. Martha Stewart and Sandra Lee have become the queens of this sector through their lifestyle advice outlets, namely Martha Stewart Living and Semi-Homemade. As a source of inspiration for table settings, Pinterest has an endless stream of images divided into categories like “elegant,” “DIY,” and “rustic.” Any of these tables involves a good deal of aesthetic manipulation involving color schemes, flower arrangements, textiles, and centerpieces. Even the currently trendy “rustic” table (e.g., a wood farm table accented with burlap, bunches of wildflowers tied with twine, and Ball jars) is a carefully planned aesthetic. A plateau on a formal dining table at Hotel de Charost in Paris in September 2010. Why do we do this? People haven’t always cared about beautifying their dining tables. The Western craze for dressing the table took hold in the late 18th century, when the aristocracy turned table-setting into a form of expression. Ever since then, thematically curated tables have often expressed the desire to escape from daily life to a fantasy world, none more ironic than the rustic table, which hearkens back to a time when nobody cared about what the table looked like. A dining table was once a simple, knockdown affair. In the Middle Ages, when life was rough and uncertain, “setting the table” meant placing a wooden board on top of two trestles in order to make a somewhat sturdy but ultimately moveable table. The table was merely a platform for food to be laid upon. Even at royal feasts, the only ornament on the table was a nef, a vessel made to hold salt. People brought their own knives and spoons, and ate on slices of bread instead of plates. Tables might be covered with cloth, but this was less decoration and more a giant, communal napkin for diners to wipe their hands on. 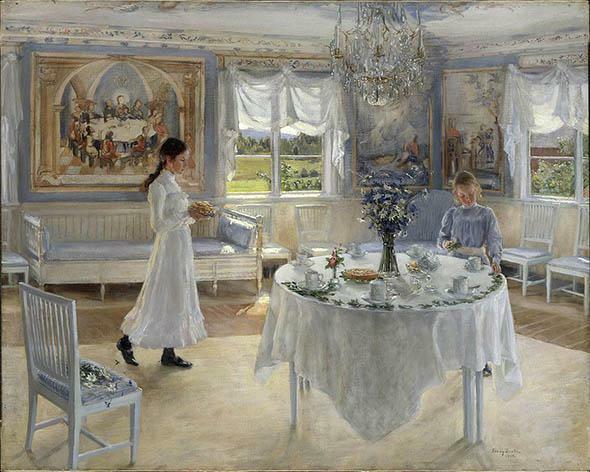 A Day of Celebration by Fanny Brate, 1902. Girls decorate a table with flowers beneath a painting of an undecorated medieval table. Over time, improved manufacturing technologies led to a boom in utensils and flatware. 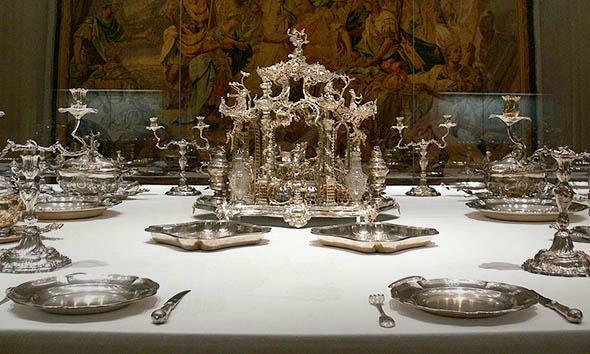 Elite European tables have displayed silver dishware since the Middle Ages, but the variety of dishes for holding food continually increased, as they became more specific and more ornate. This trend peaked in the Victorian Era, when an abundance of silver, glass, and porcelain contributed to the table’s shiny new look, with about 20 pieces per place setting (including dishes, glasses, and silverware). However, it was the shift from service à la française to service à la russe between 1750 and 1900 that led to elaborate, sometimes absurd, table settings. Service à la française brought all the dishes to the table at once, so the concerns of laying a table focused on where to place each dish. 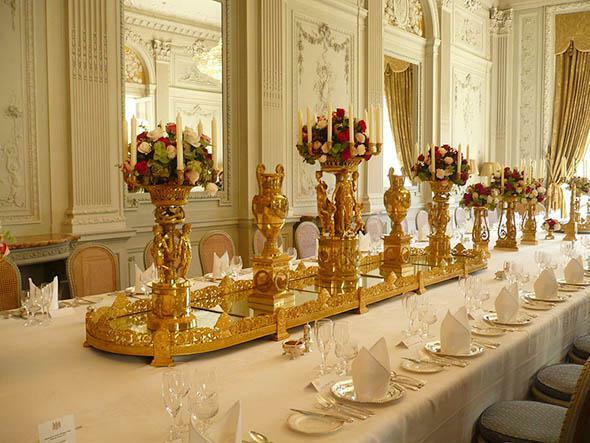 By contrast, service à la russe left the table bare as servants brought out each course one at a time to be placed on the sideboard, and served to guests on individual plates, as exemplified in Downton Abbey. The void had to be filled with pretty things for the eye to latch onto, leading to an elaborate visual culture that persists on our tabletops. 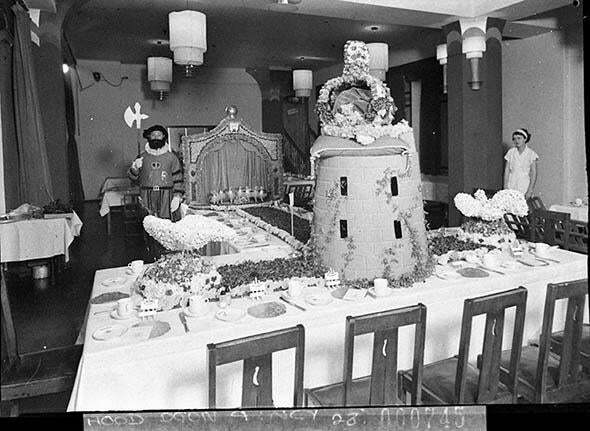 Centerpieces quickly became another way for the aristocracy and high society to display their wealth. In the mid-18th century, the wealthy laid their tables with ornate silver baskets called epergnes, long mirrored trays called plateaus, flowers, and candelabras. a canal of pure water … flowing from a silver fountain beautifully constructed at the head of the table. Its banks were covered with green moss aquatic flowers; gold and silver fish swam and sported through the bubbling current, which produced a pleasing murmur where it fell, and formed a cascade at the outlet. 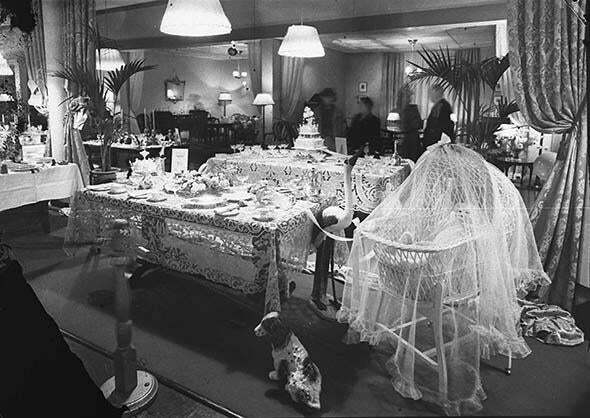 A baby shower themed table at a table setting exhibition in Sydney 1941. Called “The Stag at Harvest Eve”… planned for the ravenous male. … At one end … is a huge Grecian head of white plaster…the goddess of the harvest … dressed up in sprays of wheat and she wears a headdress of an enormous round loaf of bread on which are stuck various fruits and little French crescent rolls! To balance this lady at the other end of the table, there’s a huge, decorative white plaster hand clutching a sickle. Such an elaborate display seems like the spiritual ancestor of Sandra Lee’s “tablescapes.” The TV chef coined the term in 2003, giving a name to the “artistic arrangement of articles on a table,” as Wiktionary puts it. The portmanteau evokes landscaping, cultivating a table to fulfill your desires. The housewife’s initial obsession with creating an elaborate table design may have come from a desire to dine like the wealthy and escape from the boredom of staying at home, but the urge to beautify survived the sexual revolution. Even liberated, working women (myself included) feel the need to breathe some life into quotidian dining now and then. Although it may seem a bit silly, Sandra Lee chooses to do so with cheery colors, crafty centerpieces like giant paper flowers, or a cardboard winter village, and names for tablescapes like “A Wisteria Wish.” The term tablescape also contains the word “escape.” If you feel like escaping to the Mediterranean, Sandra Lee has a tablescape for you to recreate, with pictures and instructions to follow on her website. Her concept and aesthetic have been well-received by the public—her signature ’scapes have been auctioned off, and there are even tablescape competitions, as parodied in a 2013 episode of Bob’s Burgers. A dramatic table setting for a ball at the Regent Theater in Sydney, July 1937. The latest trend in table setting is the rustic table, which appears to be a counter-reaction to the tablescape. You might see this kind of table at weddings, at dinner parties, beckoning from the pages of Kinfolk, or at that restaurant in Brooklyn. By stripping the table bare and doing away with the papier-mâché, crystal, color coordination, and professional flower arrangements, the rustic table attempts to take us back to a simpler time or way of life (like the era when people ate off of pieces of bread instead of plates). The rustic table, with its I-live-on-a-farm aesthetic, says that you recycle and eat sustainably, that you’re down-to-earth and don’t care for material goods, and that you certainly don’t think about setting a fancy table. However, considering that most of us don’t live on a farm, the rustic table is an idyllic fantasy, just as curated as a Sandra Lee table. Give it up, rustic ’scapers- most likely you didn’t just happen upon that burlap while cleaning out the barn.